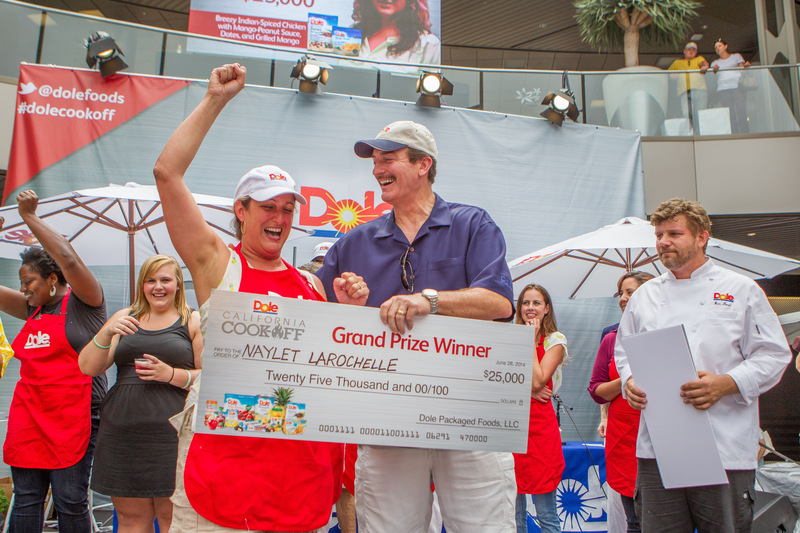 LOS ANGELES, CA--(Marketwired - Jul 1, 2014) - With the help of Chrystal Baker from DuoDishes.com, Naylet LaRochelle from Miami has won the sixth annual DOLE® California Cook-Off grilling competition and a grand prize of $25,000 for her winning recipe, Breezy Indian-Spiced Chicken with Mango-Peanut Sauce, Dates and Grilled Mango. LaRochelle was one of three finalists flown out to Los Angeles Saturday, June 28 to participate in the 2014 DOLE California Cook-Off, along with runner up Roxanne Chan of Albany, Calif. with her Singapore Scallop Stacks and Barbara Estabrook of Rhinelander, Wisc. 's Grilled Tropical Fruit 'n Shrimp Crostini with Prosciutto Crackles. The Cook-Off competition proved to be fierce and fun, as the three talented finalists faced each other in the center plaza of the high-trafficked Santa Monica Place outdoor mall to prep, cook and plate a delicious recipe in 60 minutes or less using at least one DOLE packaged food product, up to ten additional ingredients and a Weber® gas grill. An audience of thousands cheered on the finalists, including repeat contender Barbara Estabrook who fought for the prize in 2011, while enjoying samples of DOLE products and participating in raffles throughout the day. Giveaways included signed copies of Taming the Feast by Chef Ben Ford and several Weber grills. LaRochelle has won numerous other national cooking competitions in the past several years and choose this recipe to submit because she thought it really highlighted what Dole packaged products is all about -ease and versatility to help her amplify her recipes at home. "I am so excited and honored to have won the 2014 DOLE California Cook-Off using one of my go-to kitchen staples, Dole Frozen Mango chunks!" said LaRochelle, 2014 DOLE California Cook-Off Champion. The acclaimed Chef Ben Ford, Executive Chef and Proprietor of Ford's Filling Station in Culver City, Calif. and author of the newly released Taming the Feast led the esteemed panel of judges and demonstrated a variety of grilled dishes on stage featuring Dole. The judging panel also included Dole Packaged Foods President Brad Bartlett, local TV personality and lifestyle reporter Mar Yvette, and Carly Reynolds, the Dole.com sweepstakes winner from Lexington, KY. The finalists' recipes were judged on the best use of DOLE Packaged Foods products, creativity, flavor and taste, ease of preparation, and presentation. Local Mixologist of This Girl Walks Into A Bar, Jordan Catapano, offered the audience summer cocktail tips and demonstrated three refreshing cocktails infused with a variety of DOLE packaged food products on stage. The 2013 Cook-Off Champion, food blogger Ally Phillips, hosted the entire affair and proudly passed the champion title onto LaRochelle while Dole executives presented the $25,000 check. "Each year we are impressed by the quality of the recipes submitted for a chance to win $25,000 and it's exhilarating to see and taste our DOLE packaged ingredients in each of them," said Michael Contreras, spokesperson for Dole. "The recipes prepared in this year's sixth annual Cook-Off competition were especially mouthwatering and we are happy to welcome Naylet as the DOLE Cook-Off Champion." Select food bloggers contributed their expertise as acting sous-chefs in the competition, including Chrystal Baker of The Duo Dishes, Carrian Cheney of Oh Sweet Basil, and Ericka Sanchez of Nibbles and Feasts. Check out Facebook.com/Dole to keep up with the latest news and promotions from Dole, or recipes.dole.com for easy and delicious ideas for entertaining or everyday use. Dole markets a full line of canned, jarred, cup, frozen and dried fruit products and is an innovator in new forms of packaging and processing fruit and vegetables. For more information please visit www.dole.com.